RMJ Tactical's Kestrel tomahawk is a shorter version of their original (and popular) Eagle Talon tomahawk. Its design is suited to use as a close quarters tool and weapon. 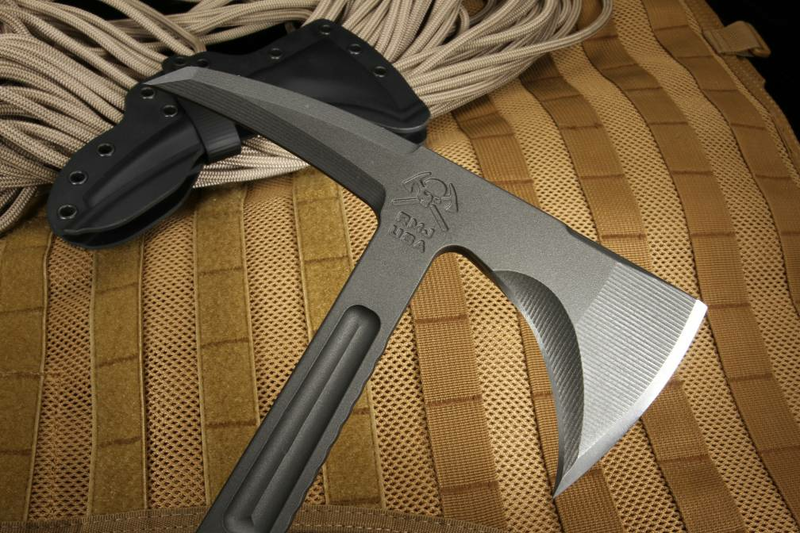 Inspired by tomahawks from the French and Indian War, the Kestrel, like the Eagle Talon before it has the lines and features that made it dangerous in battle in the eighteenth century, upgraded in materials and crafting techniques to remain useful in the modern day. The Kestrel's head varies slightly from the Eagle Talon's, with a slightly longer forward edge and a slightly shorter spike (each are three inches long on the Kestrel), though it maintains the same seven-inch length from the forward edge to spike. Made from 3/8" oversized thickness billet machined 80crv2 steel, it maintains a 54 HRC hardness on its striking surfaces and a 30 HRC on the neck and tang. This is thanks to the differential heat treatment used on the Talon and Kestrel 'hawks, offering greater impact resistance and hardness along the forward edge and spike while leaving needed flexibility and toughness in the spine. In addition, the tungsten cerakote finish gives the Kestrel greater resistance against wear, corrosion, and chemicals, along with better impact strength. This is similar to regular cerakote, with the metal shaded darker due to the tungsten. The handle is a full tang I-Beam design, 3/8" thick with G-10 3D machined scales - in the color of your choice: black, hyena brown, or dirty olive. 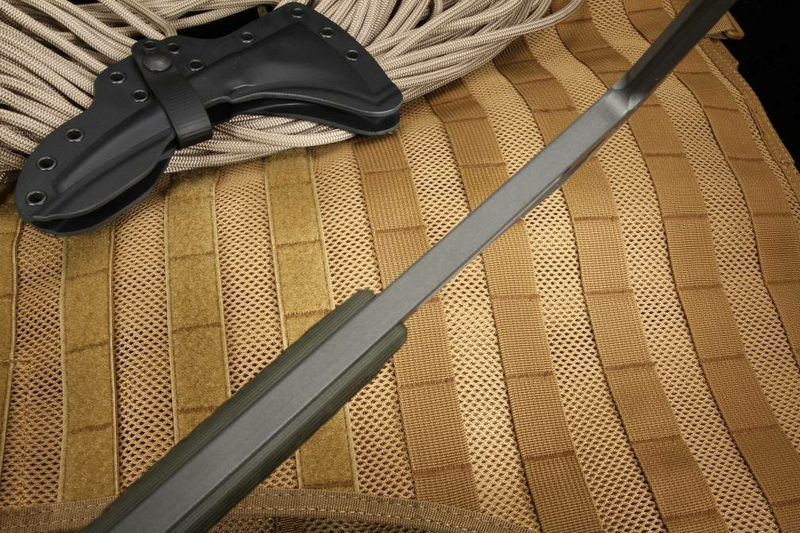 This brings the overall length of this RMJ breaching tool to 13" and the weight to twenty-five ounces (thirty with bottom-eject Kydex scabbard). 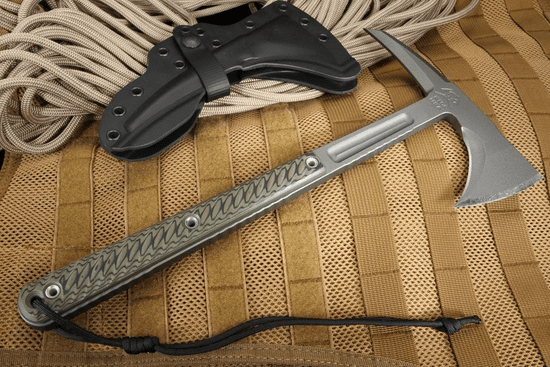 At that length, the tomahawk can either be placed on the belt and hang down the leg, or the scabbard can be worn bottom-side up, so the handle can tuck under the arm and be concealed under a jacket. The Kestrel is made in the USA with a 100% lifetime guarantee; order yours today through KnifeArt.com. 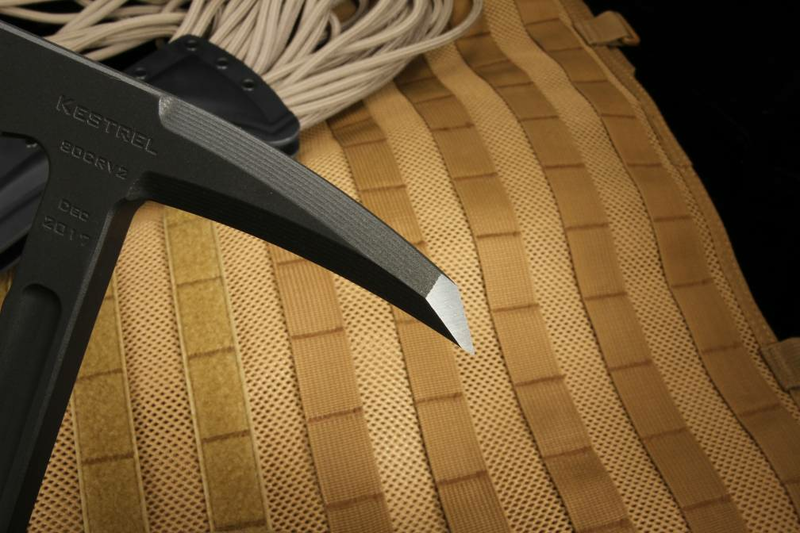 KnifeArt is an authorized dealer for RMJ Tactical, with twenty years plus experience in the high-end bladed weapons business. They offer same business day service with free shipping, a selection of only the finest quality weapons, and easy exchanges on all purchases. Extreme caution is required when using this multi-bladed tool and when using and removing it from it's sheath. International orders are encouraged but because of the oversize and overweight nature of the order, shipping charges will be higher and individually quoted after an order is placed. Order arrived very fast. Love the hawk, not the sheath, especially after the notice that arrived with the hawk stating "you will cut yourself" using this product. Once I saw the sheath I could understand why. Extremely difficult to remove hawk from sheath. I'm having a custom sheath and harness made (about $90) to carry this in the field. Just something to keep in mind.